Earlier today, I took a trip to my family’s local Cinemark theater – the Century 16 in Belmar – to show my brother the glory that is Mad Max: Fury Road. I wish I could say a good time was had by all, because while the film remains spectacular – and only gets deeper, richer, and more rewarding on multiple viewings – the exhibition practice I saw in that multiplex was so heinously incompetent that it has me convinced, more than ever, that the major modern theater chains are completely out of touch with the basics of their trade. This line of thought was initiated for me a week ago, actually, when I went to see Fury Road for the first time, at the Cinemark Century Boulder, and was astonished to see that the multiplex did not mask the screen for the film’s widescreen aspect ratio (more on what this means in a moment, but in short, it means the film was projected in a ‘letterboxed’ 16x9 ratio, as it would look on a TV display). Even the best theaters make mistakes now and again, of course, and since I had never previously had a bad experience at the Century Boulder, and was so excited to see Fury Road, I shrugged the problem off and rolled with it; the film itself was mesmerizing enough to distract me from the glaring exhibition problem. But today, at the Century Belmar, the same problem recurred. I was flabbergasted – was this a bizarre coincidence, or was something more sinister afoot? As the trailers began to roll, and it became clear to me they were not going to mask the screen at this theater either, I left the auditorium to investigate, dipping into a few other auditoriums – another screening of Mad Max and one of Tomorrowland – only to find that these screens, too, were left unmasked. A cursory search on Google led me to multiple forums and comment sections where people reported the same problem. This was no mistake. This was intentional. Cinemark Theaters are, seemingly as policy, no longer masking their screens for anamorphic widescreen movies. This is a problem. A big problem – and it only reinforces my perception and the perception of many other filmgoers that the theater chains are practicing their trade with an active contempt for the consumer. Whether you are familiar with the implications of this issue or not, this is a problem modern moviegoers should care about. And today, I am going to dive into this issue, and some of the other related issues at stake in modern moviegoing, to shed light on just how bad things should become. At this point, I am simply fed up, and you should be too. First, let’s define some terms. There is nothing technically complicated at work here, and these are notions even casual filmgoers should be familiar with, in idea if not in name. Aspect ratio refers to the visual parameters of the cinematic image, and in modern cinema, we generally have two of them. One is 1.85:1, also known as Flat, and this is almost identical to the 16x9 rectangular dimensions of a standard widescreen television. It is the ratio used for almost all TV programming these days, and commonly used for comedy films and many dramas, such as last year’s Best Picture winner, Birdman. The other aspect ratio is 2.39:1, also known as Scope or Anamorphic, and is a much wider image. Chances are, when you go to see a film in a multiplex – especially a big summer spectacle, like Avengers: Age of Ultron, Mad Max: Fury Road, or Tomorrowland – you are watching a ‘Scope’ image; it is the preferred aspect ratio of epics, action films, and even many modern dramas (like the 2013 Best Picture winner, 12 Years a Slave). Because two different aspect ratios exist, movie theaters have, for decades, been constructed with screens and curtains that can ‘adjust’ to suit the differing ratios. This is why, when one goes to see a movie, you might see curtains either expand to the left and right, or compress from the top to bottom, to adjust a screen from ‘Flat’ dimensions to ‘Scope’ dimensions. This process is called Masking, and it ensures that the image fills the space of the screen, with boundaries clearly drawn by the black curtains. It is standard operating procedure for movie theaters, and has been for many decades now (this is a point I cannot stress strongly enough). Failure to mask a screen properly can result in numerous problems. In the days before digital projectors (which are the source for many of our modern masking problems), masking errors would typically result in an image being distorted in one way or another. For instance, I remember going to see Terry Gilliam’s The Imaginarium of Doctor Parnassus at the United Artists Denver West theater in 2009, projected on 35mm, and while the projectionist played the film in its proper aspect ratio – Flat, 1.85:1 – he left the screen dimensions improperly masked at 2.39:1. Since this was an auditorium that ‘shrunk’ a screen from Flat to Scope, rather than expanding, this meant that the top third of the image was being projected above the curtain, with empty space on the sides. The film was visually unintelligible. In other cases, a Flat film might be projected on a Scope screen with ‘pillarboxing’ – empty space on the sides – or more problematically, a Scope film might be projected on a Flat screen, distorted to fit the boundaries (in these cases, everything in the image would look unnaturally tall and bunched up). There are other ways improper masking and projection might combine to create an undesirable viewing experience, but in the days of 35mm, I would say these instances were rare, in part because the projectionist had full control over the projector and the screen dimensions, and could fix a problem with relative ease when mistakes were made. Now, in the days of digital projection, masking errors are much more common, and are much less prone to be fixed – digital projectors are built and programmed so that they may not be interfered with after a film begins, and they have rigid pre-set parameters for possible aspect ratios. The most common masking issue these days, and the one I am talking about here, is a Scope image (2.39:1) being projected on a screen with Flat boundaries (1.85:1), with black bars encoded at the top and bottom of the screen to fill the extra space. In other words, an image that looks exactly like a Scope film on a widescreen television – just like this movie would look at home, on DVD, Blu-ray, or digital streaming. In the past, when this particular masking issue pops up, it’s tended to be an error on the part of the projectionist, or a problem with the file. In 2013, I attended a marathon screening of Edgar Wright’s Cornetto trilogy at the Alamo Drafthouse in Littleton – a theater committed to proper projection of movies – and when the film Hot Fuzz started, there was an issue with the sound, and in fixing it, the aspect ratio was accidentally shifted from the proper ‘Scope’ form to a letterboxed ‘Flat’ image, and the curtains were hastily redrawn. We went from seeing Shaun of the Dead fill a full anamorphic widescreen frame, big and immersive as it was meant to be seen, to watching Hot Fuzz, letterboxed within a much smaller window, due to a simple error. And because of how these modern digital projectors are programmed, the mistake was impossible to fix. Now, at Cinemark – and, potentially, other theater chains – this way of displaying a film has become a matter of policy, not an issue of unfortunate mistakes. All of their screens are drawn to Flat dimensions – 16x9, like your television at home – and if a film was shot in anamorphic widescreen – as the majority of modern releases are – it will be displayed with black bars at the top and bottom of the screen. This is utter garbage, in so many ways that I barely even know where to begin. I suppose I should start by explaining why this impacts the viewing experience, because while I expect most viewers will notice the difference, many might wonder why it is problematic. If the projected image is still bright and clear, the sound is still good, and the seats are still comfortable, it’s not that big an issue, right? Wrong. While I will not claim that this refusal to mask a screen ‘ruins’ a film, or makes it look awful and unwatchable, what matters is that this practice absolutely does make the experience inferior. When a widescreen image is properly masked, it ideally creates an ‘immersive’ viewing experience – this was the idea behind anamorphic widescreen, when it was initially introduced as ‘Cinemascope’ in 1953. The image is as wide as the human eyespan, allowing a viewer’s vision to be completely consumed by the screen. It is a large part of why Scope is the preferred ratio of epics and spectacle, because when exploited properly, widescreen images can be truly larger than life. When you project a Scope image onto a Flat display with letterboxing (these are the black bars at the top and bottom of an image), that effect is lost. The image itself is still wide, but it is now bordered by thick, visible bars, and rather than feeling immersed, the viewer is prone to notice how the image is ‘confined’ by these visual boundaries. Unlike black curtains, these letterboxed bars – which are, in these cases, hard-coded into the image, projected alongside the film itself – are not ‘invisible’ when one watches a movie. They are very visible indeed, and especially for a film-literate viewer like myself, they can prove incredibly distracting. For instance, when projected and masked properly, a Scope image emphasizes width, the horizontal axis of the frame being the dimension that draws a viewer’s attention. A Flat image, being taller, naturally draws our attention to the vertical axis. Compositionally, this is the key difference between them, and neither is necessarily ‘superior’ to the other; it all depends on the needs of the film in question. But when one projects a Scope image within a Flat frame, that ‘vertical’ axis continues to act upon the viewer, and the intended ‘horizontal’ axis is effectively negated. Because the image is letterboxed, and the bars are hard-coded into the image, the light from the projector still shines within the entire 16x9 space. Our eyes are thus drawn to the vertical space of the frame, even though a Scope 2.39:1 image is composed with horizontality in mind. This is what robs an improperly masked image of its greater sense of ‘grandeur,’ and can also, with certain films, create a sense of disorientation. 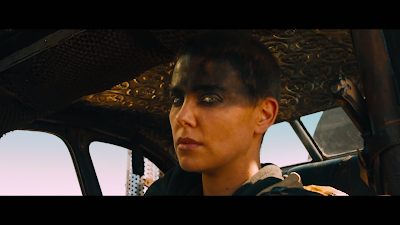 Trying to focus on the horizontal axis during Mad Max, for instance, when the masking is naturally drawing my eye toward the vertical, can become exhausting in a hurry, and even, on this second viewing, made me feeling physically queasy at several different points. 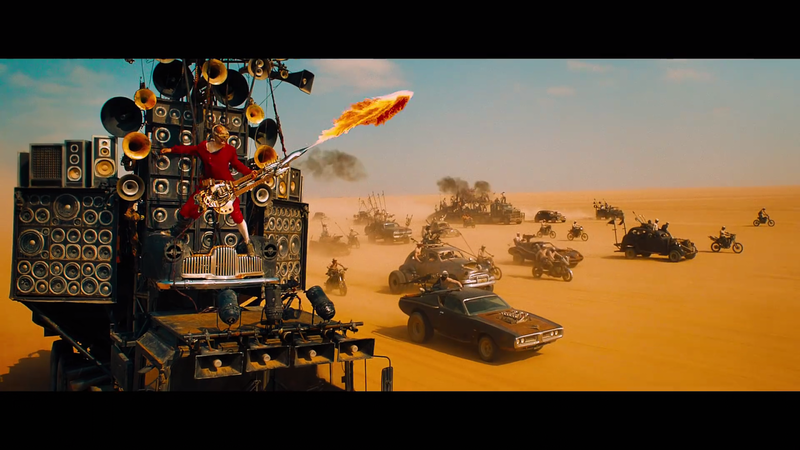 And Mad Max is actually one of the widescreen films better suited to this kind of ‘letterboxing’ treatment, as it is bright and colorful throughout, and the filmmaker’s intended image parameters stand out against the forced black bars. 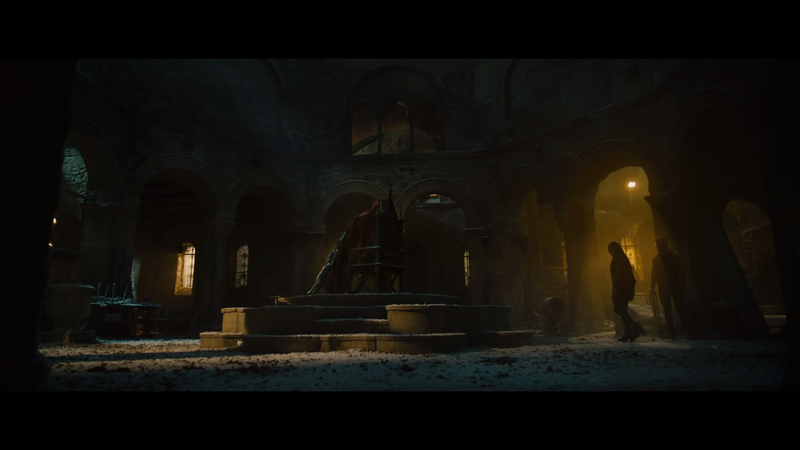 But what about a film like Avengers: Age of Ultron – to use another recent example – which is much visually darker, and includes many more nighttime scenes where colors are much less bright. In those cases, the boundaries of the aspect ratio can seem to ‘bleed’ into the black bars; when the image is intentionally dark, and has been encoded with black space above and below the frame, it becomes tough to distinguish where the cinematography ends and the letterboxing begins. And as a result, the image would, in this case, look poor and incomprehensible. This is why masking is such an important process in film exhibition, and why it has been standard practice since widescreen aspect ratios were introduced in the 1950s. The image is everything to film, and it must be displayed properly. It’s not like masking a screen is difficult or complex, either. Generally speaking, it is a very simple process, especially when one only has two fixed aspect ratios to deal with. All of the Cinemark multiplexes that are adopting this new and inferior way of exhibiting movies were built to be capable of adjusting the curtains to create proper screen dimensions. Virtually all movie theaters are. As far as I know, it really is as simple as flipping a switch; when a film is in the Flat ratio, one chooses that setting, and when a film is in Scope, you choose the setting that adjusts the curtains to the dimensions of 2.39:1. This technology already exists within these movie theaters. It’s there, and it takes no effort whatsoever to make use of it. These theaters have been doing so for years and years and years. Now, that all seems to be changing, and I find it absolutely infuriating. There are really only two explanations here, and neither of them are good. Either Cinemark and other likeminded chains have become exceptionally lazy, and chosen to take masking out of the equation all together, proper exhibition be damned, or – and I suspect this is the case – newer digital projectors are even more limited in their settings than old ones, and simply project everything in 16x9. If that’s the case, it’s horrifying, and it means that chains like Cinemark may in fact have their hands tied. Many multiplex screens are built so that the screen ‘shrinks’ from the top to form the wider Scope ratio, which means the image must be projected at the bottom of the overall screen space to be properly masked. If a projector outputs everything in 16x9, thus letterboxing widescreen images, that means a Scope film is displayed in the middle of the screen – and these auditoriums may not have curtains that can be masked this way, meaning that a crappy letterboxed image may be the best solution. Depressed yet? You should be, as this is yet another instance of studios, projector manufacturers, and movie theater chains conspiring to sell you a compromised product at an absurdly inflated price. It certainly would not be the first instance of such a problem. To save costs and increase profits, theaters have adopted a number of heinous policies in recent years, from refusing to change out projector bulbs when they become dim – which results in an image that is poorly-lit, ugly, and sometimes difficult to see – to laying off experienced projectionists in favor of cheaper, untrained labor, to relying on subpar and/or poorly calibrated sound systems, etc. All while ticket prices have inflated at a rapid, alarming rate in recent memory. The more costs rise, the lower the quality of film exhibition itself becomes. And that is indeed a sobering thought. The thing is, movie theater chains are struggling. The switch to digital projection was costly and cumbersome, squeezing the majority of America’s independent theater chains out of business entirely. Meanwhile, the costs are rising exponentially on major Hollywood productions, and as the studios take a bigger and bigger cut of a film’s box office earning, that leaves the remaining oligopoly of chains scrambling to make up the difference. This is why concessions have become prohibitively expensive, of course, but also why ticket prices keep soaring, and certainly contributes to the half-assed way most of these theaters are now run. More importantly, though, theatrical cinema has more competition now for audience attention than at any other point in the medium’s history. The rise of online streaming and the ease with which audiences can access any piece of media at home has undeniably impacted movie-going trends; the biggest of the big tent-pole features may not see a hit, as they are major cultural ‘events’ audiences will still flock to in a multiplex, but mid-budget and smaller features are continually having to adopt to new distribution platforms, as a theatrical release simply no longer cuts it. Americans go to the movies less and less these days, as audiences become increasingly decentralized. Movie theaters are no longer just competing with radio or television – they are competing with the might of the internet, with a flood of media that comes at people from all directions. No longer a monolith, movie theaters are merely one pillar of a far larger media landscape than existed previously, and this is why it absolutely baffles me how little the major theater chains are doing to differentiate themselves from the flood. The current situation really is analogous to the 1950s, when television became a mainstream staple of the American household, and theaters saw audiences dwindle rapidly as it became easier to stay home and watch TV than make a trip to the movie theater. Today, this divide is so much more intense, as Americans do not merely have TV at home, but affordable high-definition and televisions and elaborate home theater set-ups that can, in many cases, rival what the multiplexes have to offer (in addition to an entire world of easily streamable media). The difference, however, is that in the 1950s, theater chains and studios made every effort to bring audiences back to the movie houses. This, in fact, is why widescreen was invented in the first place. Cinema’s original aspect ratio, known as Academy Standard, was roughly 1.33:1, identical to the dimensions of an original ‘fullscreen’ television set. To fully differentiate the filmgoing experience from television, multiple widescreen processes were developed in the early 1950s. A film or television show viewed at home was ‘small,’ a square box on a relatively little TV set, but a film viewed in a theater could be big and wide and immersive, a clear reason to opt for a movie theater rather than staying at home. Today, I feel the exact opposite is being done. Televisions are getting better and more technologically advanced with each passing day; 4K and 3D televisions are readily available, and standard 1080p TV sets are, of course, no slouch in the visual department. One can have a tremendously satisfying viewing experience at home, even if there are some compromises. A 16x9 television cannot, of course, display a Scope widescreen film without letterboxing, meaning big ‘spectacular’ movies are, in theory, still better viewed in a movie theater. So what do these movie theaters do? Make a widescreen movie look exactly like it does on your television at home. It simply does not make one lick of sense to me. HDTVs have already successfully and affordably emulated the resolution of theatrical digital projectors, and home theater sound systems can, in many cases, be just as good as what you hear in a theater. One of the last true differentiating factors between the home and theatrical experience is a theater’s (theoretical) ability to show a widescreen film in its full, lush, larger-than-life aspect ratio. And now one of our nation’s largest chains has gone and thrown that away. In fact, the last few years has really been a steady saga of multiplexes making their cinematic experience look more and more like television. The switch to digital projection was bad enough, as physical film – 35mm – had long been one of the best reasons to opt for a theater over a home viewing experience. It isn’t that I necessarily dislike digital projection inherently; it can look lovely, especially as digital camera improve and filmmakers continually learn to exploit the unique properties of digital photography. But I can get a perfectly nice digital image on my television, and if I wanted to save up some money for a nicer TV, I could do that, and get an even better image for a fairly affordable cost. When a theatrical digital projector operates at the same resolution as the screen with which I watch television, I start to question the point of going to the movies. When you take away the proper aspect ratio, I question that purpose even more. And make no mistake: This is a very slippery slope chains like Cinemark are embarking upon, because choices in exhibition absolutely impact the way films are produced. When the switch from 35mm projection to digital projection was made, a switch to digital photography came along with it, in part because there seems to be little purpose in shooting a film on celluloid when most audiences will never have the opportunity to see it that way. There are many other factors of course, including cost and, in some cases, artistic intent, and the ‘filmic’ look of a 35mm image is still visible in digital projection (though I do find it depressingly diluted), but at the end of the day, this this factor does play a role. Thus, it makes me wonder: If theaters simply start refusing to play widescreen movies in their intended aspect ratio, instead letterboxing everything and diluting the visual impact, will filmmakers start opting to shoot more films in the Flat ratio, because they at least know it will be properly represented? More hauntingly, what if audiences start getting annoyed with those pesky black bars at the top and bottom of the screen, as they have on television for decades? 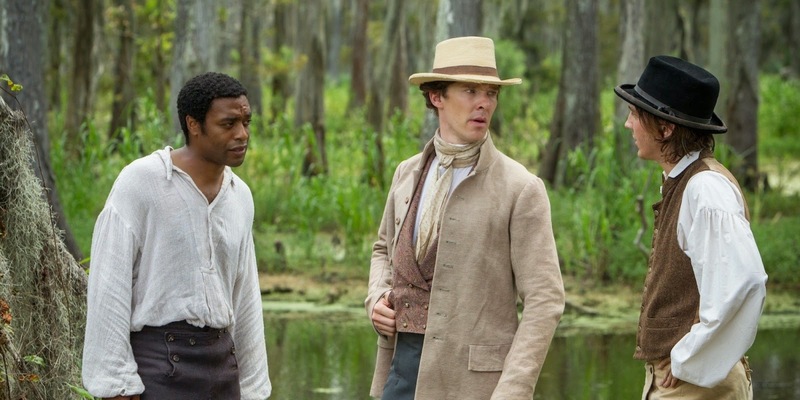 What if enough complaints and confusion start being voiced about letterboxing, and theater owners demand studios send them a cropped 16x9 version of the image for theatrical exhibition? That would be rather horrifying, wouldn’t it? And if you think this line of thought sounds crazy, consider that the cropping of widescreen films was standard for the entire lifetime of 4x3 television sets, and has, in the era of widescreen TVs, again become commonplace, with both Scope and 4x3 images being horizontally cropped to fill displays. Uneducated audiences just want their screens filled, and while this is a problematic idea on a television (which cannot, for obvious reasons, ‘adjust’ its dimensions), it is a perfectly reasonable expectation in a movie theater, because that is the way it has ALWAYS been done, throughout the history of cinema. I would not be surprised at all if I walked into a Cinemark theater in a few years only to see the latest Scope-ratio blockbuster cropped and mutilated to fit a 16x9 screen. And that is not a future I want any part of. This entire debacle is especially depressing to me because Cinemark was the last major movie chain in Colorado I was willing to give my business to. I stopped visiting Regal Cinemas (which includes United Artists) a long time ago, because their staffs are so poorly trained, their projectors are so dim, and their sound systems are so generally inferior that it wasn’t worth the exorbitant ticket prices. AMC Theaters are better, certainly, but also the most expensive chain in the state, and have enough problems – including, again, dim projectors – that I only reluctantly give them my money. For a long time, Cinemark was honestly the complete package. They were committed to showing movies competently, with bright projectors and good sound and comfortable seating, and they have historically had better pricing than either of the major competitors. Since there are several Cinemark theaters nearby, they have been my default chain when seeing a film at a major multiplex. But no longer. If Cinemark is going to exhibit films with such little care, then I have no need to give them any more of my money. What this means, however, is that I find myself in the uncomfortable position of boycotting all three of the major theater chains operating in this state. I don’t want to go to Regal, AMC, or Cinemark, because I can only expect an inferior experience for an exorbitant price. And that leaves me – not to mention other, similar film fans – with precious few options for seeing major motion pictures. Here is the complete list of theaters I still actively enjoy going to: The Alamo Drafthouse in Littleton is easily the best movie theater in Colorado, with big, bright, gorgeous screens, excellent sound, expert staff, and fair pricing. They are the best option currently available. The Harkins Theatre multiplex in Northfield is also excellent, and has the best single auditorium anywhere in the State with the outstanding Cine Capri. The 4 Landmark Theatres in the Denver area – the Mayan, the Esquire, the Chez Artiste and the Greenwood Village – are very good, and while I encounter the occasional exhibition problem at these venues, they are best arthouse outlets in the state, and have an admirable commitment to quality. Finally, the Sie Film Center, home of the Denver Film Society, is an outstanding venue for independent cinema. They too unfortunately have one screen they do not mask for widescreen movies, but it is their smallest auditorium, and I understand there may be cost concerns there. So there you have it: A grand total of seven movie theaters I consider acceptable venues for filmgoing in Colorado, none of which are particularly close to where I live. I tip my hat to each of these venues, and praise their efforts wholeheartedly. The larger problem is not theirs. But the problem does exist: On the whole, going to the movie has become a thoroughly unpleasant experience. It is difficult to find a theater that will show a movie with even baseline competency, and lest you think I’m simply being picky, remember, nothing I am complaining about even approaches the realm of ‘special’ or ‘difficult.’ Showing a movie in the right aspect ratio, with a good bulb in the projector, and a sound system that is properly calibrated and intelligible, is all I ask for. That’s it. It’s how movies have been shown for many, many decades now. And after 100-plus years of cinema, the major chains are essentially surrendering to television, and throwing it all away. I cannot help but despair. When it has become so difficult to see a movie exhibited properly, in a market as big and diverse as Denver, I fear for the future of this medium. It really does feel to me like we are living in the end-times of the theatrical filmgoing experience, like the major chains are destined to destroy themselves, and cinema may fade away into an online or televisual form. I love movies. I live for movies. And movies are at their best when projected on a big screen, with an eager crowd there to share in the joy and excitement. And theater chains like Cinemark are doing their best to destroy that. I don’t understand that. And when all is said and done, it just makes me sad. I haven't noticed any problems at the Cinemark up here in Greeley. I'll pay more attention next time to make sure. I guess if I haven't noticed the black bars, nothing took away from my viewing experience. Most recent watches: Avengers 2 and Fury Road. At these theatres, at least, it's a VERY recent phenomenon. When I saw Avengers 2, it was fine. For Fury Road, they had changed things. Also possible it varies based on the auditorium and overall screen dimensions - I haven't checked all of them, of course. Maybe 3D partially hides the phenomenon as key scenes are popping off the screen anyway. Maybe theaters figure that enough people will see the more expensive 3D showings during the all-important first couple of weeks of a blockbuster movie's run that they don't need to put in the extra effort towards their 2D shows. I noticed this yesterday and thought they had run out of screens that were 2.39:1 and didn't think anyone would notice. This is terrible! Its happening in California too- the Century 13 in Monterey started this BS with "Tomorowland "and its just getting worse. This is happening in Ohio. The Tinseltown in Canton ohio is ripping out all their scope screens to install tall 1.85:1 screesn but don't mask. So frustrating. An Ex (made redundant) projectionist here. This letter boxing of scope films is happening in the UK as well. A lot of new multiplexes are just building 185 ratio screens so there's actually no option to go wider for scope. You then add the fact that they're touting 4K projectors (Sony are the worst offenders I've found) in these same theatres and it just adds insult to injury. Yes you've got a 4K image but it's now smaller in overall size. Utter nonsense. Also, and this relates to Sony as well, their 4K Cine Alta projectors require constant lens changing if you want to correctly show 2 and 3D content. This is a pain but perfectly doable if you employ projectionist. And there's the rub. Cinema chains have simultaneously installed this type of projector that requires a trained person to operate and change lenses correctly while at the same getting rid of all those capable of doing so. The results are multiplexes that can't change the lenses and don't really see any point in doing so. After all, the customer has now become the primary point of quality control for checking a print/DCP. If there are no complaints on a first Friday of release then hey, it's all perfectly fine isn't it? DCP's rarely get checked anymore at most multiplexes. They are downloaded overnight, sometimes the night before release and the KDM's are only opened at midnight or a few hours prior to release. In a multiplex with multiple releases on a Friday, it's a literal impossibility to be checked by eye. The DCP is just dragged into a playlist and an average volume setting is applied to it. And that's about all that's done to it before it goes on front of a paying audience. The sound level may get adjusted of a customer says something but it'll likely only be adjust for that performance, reverting back to the preset level for the next automated show. Going back to the lenses for a second, because they need changing they also need precise alignment with each change as the image is thrown into slightly different areas of the screen, due to things like angle, throw and auditorium geometry etc. So it's a lot easier form an operational standpoint to just not bother changing the lenses on a Sony and just have the two 3D lenses in place all the time showing two dim overlaid 2D images for 2D content. That's a side issue but it's all inextricably linked. Keep the lens fixed and don't bother moving the image position or showing scope films wider than 1.85:1. It's all really depressing that the people least capable of correct presentation are left in charge of cinemas and the truth if it is that they couldn't care less. And neither it seems do the majority of cinema goers. I say that not in a derogatory way but how else can you explain the fact that these shoddy practices continue? When you point this out to a cinema staff, be they a supervisor or a manager, they look at you as if you're nuts when you ask why they're not showing there films correctly. You can even show them what's wrong in the auditorium but they've got no idea what you're talking about. Fascinating. Thank you so much for the explanation! I have heard about the 2D/3D lens issue before, but not in this much depth. And I've definitely had the experience of talking to a manager and being met like I'm speaking a foreign language. Definitely a depressing situation. Also here in Anaheim, CA at the Century Stadium theatre. Also thought it was a mistake. Spoke to a rude, arrogant, condescending manager named Ian who provide little info. Finally spoke to the General Manager who told me that this is a corporate mandate. Presentation quality is AWFUL. I do NOT get this at all. Why do this? Makes no sense. Luckily there is AMC Downtown Disney, AMC at The Block in Orange, AMC in Tustin, and many Regal Cinemas around here. I will NOT be returning to Cinemark. Had a chance to go to a Regal Cinema in Fresno and the same problem, it looks like AMC is the only chain properly projecting and masking at all anymore and its probably just a matter of time before they screw it up too. Saw "Hateful 8" in 70MM hoping for a great experience at AMC but the audio was patched in wrong- Center was swapped for Left Surround, complained but was told that it could not be fixed becuase they have to use a special projectionist who only starts the show and then goes on break. Was at least refunded. Cinema is a lost art. I think Ill be spending more and more time with my 4K TV. I actually left my job as booth manager at a Regal theater back in 2001, because most of the screens were top-masked and they wanted me to have the masking go up in between showings so their ugly advertising slides (which shouldn't be shown at all) could be shown on the "bigger" screen, then have the masking come down when the film started and then go up when it ended. I simply refused to do that, as I believe the masking should never move when customers are in the auditorium to see it, especially on backwards top-masked screens! This only got worse as more theaters added video-projected ad programs before the movie. Cinemark is truly an awful company and they are killing the moviegoing experience. They bought out the Century chain which had many large, historical theaters dating from the 1960s- that company had a policy of not showing commercials before the movie, but the first change Cinemark made was to start showing them! Now they have closed and torn down many of the old theaters, replacing them with small, bland, generic cracker-box cinemas. Cinemark is not the only chain that is now letterboxing movies however, Regal and a smaller local company have been doing it also and I will not return to any theaters I see this at. I've just about given up on theaters altogether at this point. I had hoped to work in the theater business my entire life, but there was simply so much idiocy in the later years that I simply could not be a part of it- the higher-ups usually saw me as a pain for wanting to put on the best show possible. The bottom line is that the theater-going "experience" keeps getting worse and higher-priced, while home equipment keeps getting better and more affordable. If there were a single, really GOOD theater in my area I would make a point of patronizing it on a weekly basis no matter what was being shown, but none of the area's theaters meet that standard. I'm a former projectionist. I hate digital, it usually looks garbage compared to 35mm. I work for Cinemark, and the reason given for the lack of scope masking is that the masking was rubbing on the screen every time it moved. This was never deemed a problem throughout the 35mm years, so not sure why it is now. But yeah, it looks lousy. Like Tarantino calls digital projection, "television in public." Went to Cinemark's new theater in Sacramento today for the first time, and for the reasons given in this article it was also my LAST time there. I've really had it with theaters at this point. My local cinema (1 year old) has 1.85 screens. While they don't go wider for scoped films, they do at least have proper masking (that descends), so you get a proper black mask round the rectangle of the scoped movie. I think this is an acceptable compromise. I don't understand why more don't do this. Cineworld (a major multiplex chain in the UK) has completely abandoned screen masking, even at the Premier West End cinemas in London). I was happy to find this post via the Vox article on the history of projection. I work for a major studio in California. I was on a work trip to Miami, where we were doing screenings and presentations at the Regal South Beach 18 for ShowEast. I spent a lot of time up in the booth over the course of 3 days. On my first day, walking to the various projectors and seeing what they were showing, I noticed that none of the Scope movies had proper masking. I asked the booth technician if this was on purpose, and she said yes, it was. The next day, I was saying to the head tech manager for the theater what a horrible thing it was to not be masking the movies correctly, and that be a money-back situation for me. He told me that it was simply a cost decision, made chain-wide. When the masking mechanisms break, it costs money to fix them. I asked him if he was aware whether or not the studios—not just mine, but all of them—knew about this. I told him we should be rightfully furious at the practice. My studio is strong with animation, sci-fi, and super hero films (any guesses? ), and I told him that if any of the filmmakers of any of these blockbusters knew this was happening, they'd have a fit. He did not know if the studios knew about the practice. But he said customers don't care. He has never received a complaint, he said. And the premium theaters like IMAX and RPX don't mask, so it's okay to do that for all screens. One of the reasons I don't like going to see movies in IMAX is, most of the time, a majority of the movie I'm seeing is not in IMAX format, and you get the image letterboxed within the frame of the screen. I hate it. Only when the movie pops into true IMAX does it look good to me. But still... this manager's reasoning was eye-popping to me. It was not his fault, of course. It was a "typical" corporate decision. He then went on to tell me a story about how the Regal head office decided to not repair an elevator that was used to get to the projection booth in another multiplex. It was only for employees, so it was not worth fixing. Being someone who often hauls cases of gear into projection booths, I told him carting all that up and down stairs in such a place would be a huge inconvenience. The one Regal theater I've been to in L.A. is downtown, and I have not seen the masking issue here. I'm guessing that, since this multiplex is in L.A. and many people from the movie industry see films there, they probably mask things to pretend they care. Hope this long-winded addition to the record adds some light. If I ever go to a theater that does not mask, I've vowed to demand my money back. One drop of complaint may not get noticed, but it's worth doing! Thanks Steve! Love getting more perspective on this, even if the situation is increasingly depressing. We're down to just a few theatres here in Denver that show movies right. It's a real shame - I have to go out of my way to see a film masked, which has had the net affect of making me go to the movies a lot less. Theatre chains can call these things business decisions all they want, but the amount of customer hostility inherent in these and other practices is going to collapse in on them eventually, and I think it will be sooner rather than later. "Cost decision"??? Give me a break- in all the theaters I worked at, I NEVER saw a masking motor break. Aside from the few times you have a flat and scope movie share an auditorium, they only need to move once per week at most (having them change for the pre-show garbage is NOT acceptable, especially on common-width screens.) Do those idiots realize that part of why I no longer GO to theaters is also a cost decision? They simply charge too much for tickets these days, so it takes a LOT of nerve for them to say that it costs too much to maintain such a basic thing! I am a retired projectionist with over 30 years experience, and I am appalled at the lack of masking use. The Regal 16 theatre in my city used to use it to mask letterboxed scope films on 1.85 screens, but they no longer do. They still use side masking on their scope screens when running flat pictures. I visit Los Angeles a lot, and I visit theatres that still use masking, most of them being single-screeners. They include the El Capitan, Aero, Egyptian, New Beverly, Billy Wilder, Regent, Bruin, Village, Cinerama Dome, Arclight, and Chinese Multiplex. Also, the Plaza in El Paso masks their pictures correctly. during the Plaza Classic Film Festival.